Great Lakes Ice – Len Bilén's blog, a blog about faith, politics and the environment. 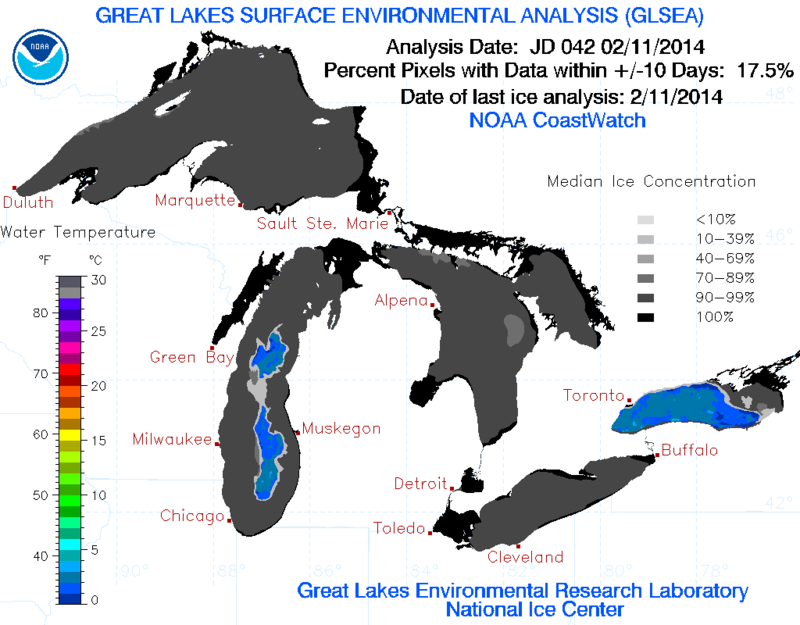 The Great Lakes ice cover 91%, the most in 35 years! A Limerick. The "vortex" has chilled the Great Lakes. Keep shov'ling those "Climate Change" flakes! It's cold on our yearly "Spring Breaks". There is still an arctic blast ongoing. Detroit had a new snow record for January. It will take a long time to melt all this ice and snow come spring. It takes 80 calories to melt one gram of ice, but only twenty to heat it from zero to 20 degrees C (68 F) . This may affect the length of the growing season. Is is climate change, or only unusual weather? Posted on March 5, 2014 Categories climate, environment, limerickTags climate challenge, Climate change, environment, Global Climate Disruption, Global Warming, Great Lakes Ice, Limericks1 Comment on The Great Lakes ice cover 91%, the most in 35 years! A Limerick. 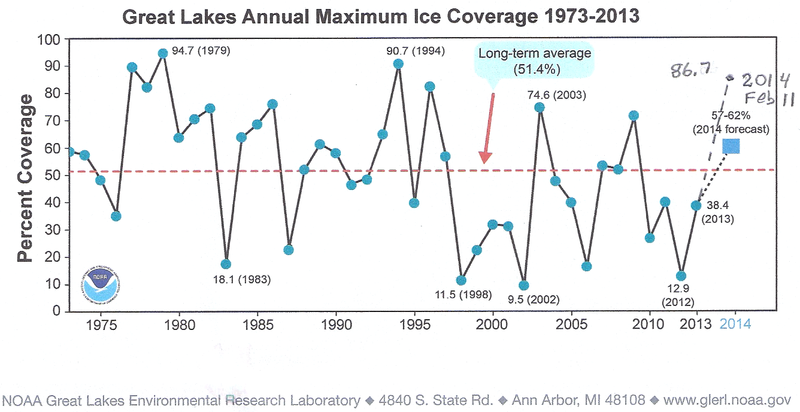 Great Lakes Ice Cover now at 88%, the most since 1994. We are in a cooling trend. 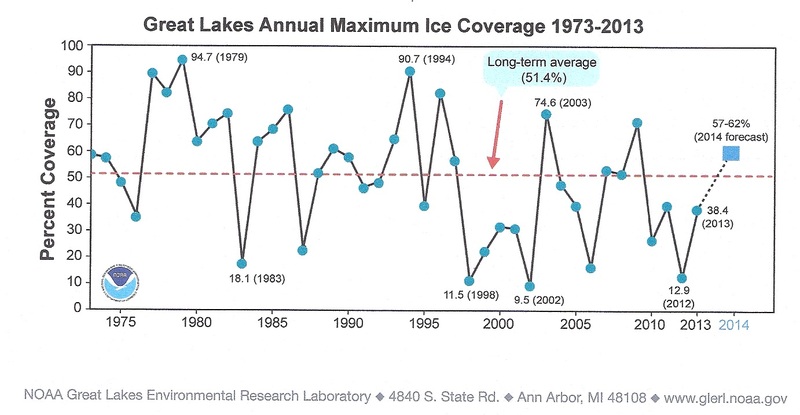 Posted on February 12, 2014 February 16, 2014 Categories climate, environmentTags climate challenge, Global Climate Disruption, Global Warming, Great Lakes Ice2 Comments on Great Lakes Ice Cover now at 882, the most since 1994. We are in a cooling trend. The Great Lakes ice cover now at 77%, the most since 1996. Here is a picture of the ice cover for Feb 4. Brr, and arctic blasts keep coming!! It will take a long time to melt all this ice come spring. It takes 80 calories to melt one gram of ice, but only twenty to heat it from zero to 20 degrees C (68 F) so you can take a dip. Posted on February 5, 2014 February 16, 2014 Categories climate, environmentTags climate challenge, Global Climate Disruption, Global Warming, Great Lakes IceLeave a comment on The Great Lakes ice cover now at 77%, the most since 1996. More than 60% ice cover on the Great Lakes. And half the winter left!!! Here is a picture of the ice cover for Jan 23. Brr, and a new, longer lasting arctic blast is under way!! It will take a long time to melt all this ice come spring. It takes 80 calories to melt one gram of ice, but only twenty to heat it from zero to 20 degrees C (68 F) so you can take a dip. Posted on January 24, 2014 January 24, 2014 Categories climate, environmentTags climate challenge, environment, Global Climate Disruption, Global Warming, Great Lakes IceLeave a comment on More than 60% ice cover on the Great Lakes. And half the winter left!! !